Robust performance from Nigeria and Ghana operations have lifted MTN Group subscriber base to 225.4 million in the third quarter 2018 financial results ending September 30 released yesterday. MTN added 2.5 million new subscribers within the period, although it recorded it lost subscribers in its South African operation. The group operates in 21 countries across Africa and the Middle East, following the sale of MTN Cyprus in September. The quarterly update for the period shows active data subscribers grew by five million quarter-on-quarter to 74.2 million. Active Mobile Money (MoMo) customers increased by 1.7 million quarter-on-quarter, to 25.8 million across the group. MTN group president and CEO Rob Shuter said "MTN recorded an improved operational performance in many markets in the third quarter. Group service revenue grew by 10 per cent year-on-year, ahead of our medium-term target of upper-single-digit growth, supported by continued strong growth in voice and data revenue. "These results were delivered in challenging operating and currency conditions. Group outgoing voice revenue increased by 5.2 per cent and data revenue increased by 23.9 percent," Shuter said, adding that the group benefited from the particularly strong performance of operations in Nigeria and Ghana, while some operations in the West and Central Africa region remained under pressure, including those of Ivory Coast and Cameroon. MTN Nigeria had an excellent quarter, increasing service revenue by 17.4 per cent year-on-year. This was led by a 52.5 per cent increase in data revenue and 21.5 per ent increase in outgoing voice revenue. 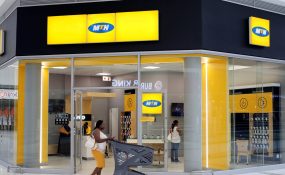 MTN Nigeria's subscribers grew by 1.5 per cent quarter-on-quarter, to just over 56 million. MTN Nigeria reported 17.2 million active data subscribers, up 15.1 per cent quarter-on-quarter, and 2.5 million MoMo customers, up 12.4 per cent quarter-on-quarter. In South Africa, the group saw a 2.3 per cent decline in subscribers quarter-on-quarter, to almost 29.5 million, but despite this, the South African operation grew service revenue by three per cent year-on-year, edging closer to its medium-term target of mid-single-digit growth. MTN Ghana delivered a strong performance, driven by robust service revenue growth of 22.9 per cent year-on-year. Ghana's active subscribers grew by 3.5 per cent quarter-on-quarter, to 17.1 million, and data revenue increased by 30.9 per cent year-on-year. Shuter said across the markets, MTN continued to invest in its networks and now has the leading network net promoter score in 10 of it markets. Reported capital expenditure to the end of September was R16.4 billion, a group capex intensity of 16.9 per cent, he said.